The image above describes how the start angles for the front and rear fenders are measured. The image below shows the end angles. On the left is shown the clearance above tire measurement and the side coverage measurement. 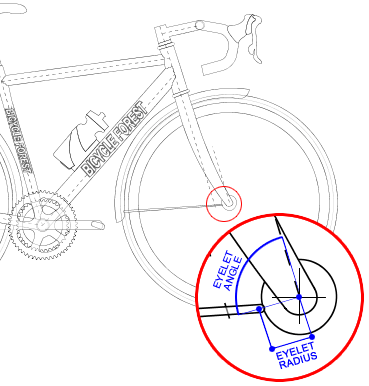 While the eyelets for the rear fender struts are defined in the Rear dropouts dialog box, the eyelets for the front fender struts are defined in the Fenders dialog box according to the diagram on the left.